Spiderman 1 1990 Todd McFarlane FULL COMPLETE SET!!! 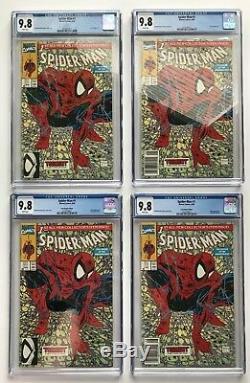 ALL cgc 9.8 GEMS with white pages!!! 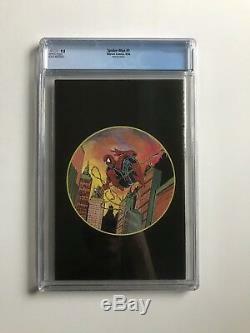 Spiderman 1 regular green cover cgc 9.8 GEM White Pages. 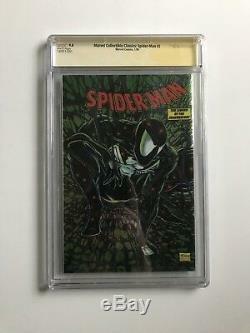 Spiderman 1 regular green cover with rare UPC cgc 9.8 GEM White Pages. Spiderman 1 RARE green poly Bagged direct variant with purple webs cgc 9.8 GEM White Pages. Spiderman 1 RARE green poly Bagged UPC variant cgc 9.8 GEM White Pages. 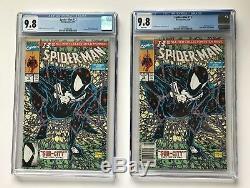 Spiderman 1 regular Silver variant cgc 9.8 GEM White Pages. 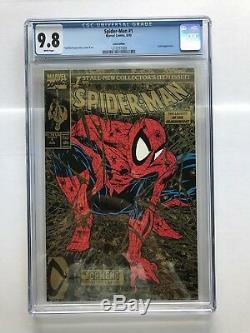 Spiderman 1 RARE Silver poly Bagged variant with NO PRICE on cover cgc 9.8 GEM White Pages. Spiderman 1 RARE GOLD 2nd print much more rare than green / silver. Came out 2 weeks after the first print. Cgc does not even acknowledge this as a 2nd print! CGC 9.8 GEM White Pages. 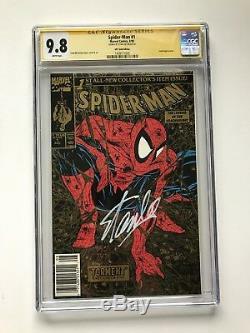 Spiderman 1 EXTREMELY RARE GOLD UPC signed beautifully by Stan Lee! This was EXCLUSIVE to Wal-Mart and is almost impossible to find in a high grade! CGC 9.8 GEM signature series white pages. Spiderman 13 one year later Todd McFarlane payed homage to himself with Spiderman now in the black suit! Cgc 9.8 GEM White Pages. 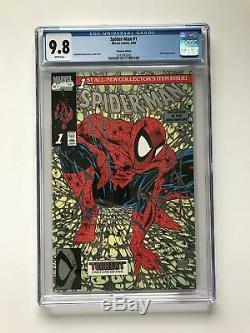 Spiderman 13 EXTREMELY RARE UPC Edition CGC 9.8 GEM White Pages. Spiderman 1 Platinum INSANELY RARE 1 Per Store thank you Marvel sent to comic stores! IMPOSSIBLE to find in NM+ shape! The ultimate Spiderman 1 Variant! CGC 9.8 GEM White Pages!! Spiderman 1 CHROMIUM aka Marvel Collectible Classics Spider-Man 1 chromium edition! This book is so RARE no one even knows the print run! Back cover in the black suit! CGC 9.8 GEM White Pages signature series signed perfectly by Stan Lee! 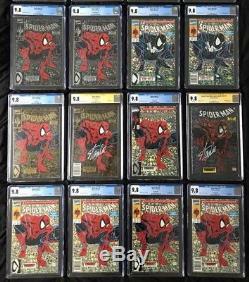 All 10 Todd McFarlane Spiderman 1 Variants all graded cgc 9.8 GEMS with white pages!! 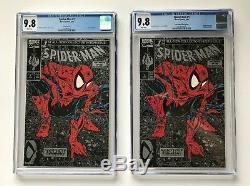 Spiderman 13 regular & UPC cgc 9.8 GEMS with white pages!! For a total of 12 huge key books all graded cgc 9.8 GEMS with white pages! Best Spiderman 1 set ever listed or available anywhere!!! All books are in New crystal clear holders! You get exactly what's pictured! Check out my other auctions. 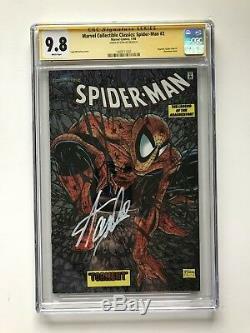 The item "Spider-Man 1 1990 McFarlane EXTREMELY RARE FULL SET ALL CGC 9.8 GEMS" is in sale since Friday, September 28, 2018. This item is in the category "Collectibles\Comics\Copper Age (1984-1991)\Superhero\Spider-Man". The seller is "mcfarlanehero" and is located in Kemah, Texas. This item can be shipped to United States.